For Royal and Premium on OS X use the OS X Installer. Epic Edition. Includes the Pirates of the Flying Fortress DLC and Two Worlds II Castle Defense. All versions except GOG.com require Reality Pump DRM. Two Worlds II: Velvet Edition includes the Pirates of the Flying Fortress DLC. The GOG.com version is the only DRM-free version and includes Two Worlds II Castle Defense in addition to the Velvet Edition content but does not include OS X support. The latest retail patch is v1.3 for both Windows and OS X. Digital distribution versions are already fully patched. Owners of Windows-only retail special editions can download the OS X Installer. The Windows install DVD is required. Worldmerge combines the originally separate world areas of the main campaign, multiplayer maps and Pirates of the Flying Fortress DLC into a unified world with many additions and balance changes. This mod requires the Pirates of the Flying Fortress DLC. Delete or rename intro1.wmv, intro1.ogg, intro3.wmv, intro3.ogg, intro5.wmv, and intro5.ogg. Default is 45°. 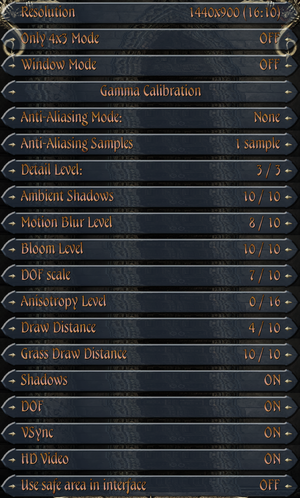 For other values see Field of view (FOV). In the installation folder make a folder called parameters. In that new folder make a file called autoexecGame2.con. If you want a different value use that instead of 60. Mouse is unusable if controller is present. Unplug or disable controller and restart the game if not working. Online features require registering an account in-game with the product key. Some TVs and other non-standard displays will not show the entire image so UI elements may get cut off. 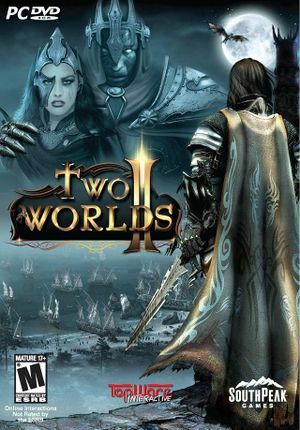 Two Worlds II has a built-in feature to counter this. 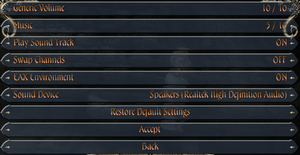 If possible disable the cropping behaviour in the display's own settings first (see Overscan for details). Choose Use safe area in interface. Adjust the edges as directed until the box shown fits the correct area. Resume play and confirm that the changes are sufficient; if not adjust again until it is correct. AMD HD3D or frame packed stereoscopic. Launch with supplied shortcut or use -adapter parameter. Launch with supplied shortcut or use -adapter parameter. See also Helix Mod: Two Worlds 2 (DX9). ↑ 1.0 1.1 File/folder structure within this directory reflects the path(s) listed for Windows and/or Steam game data (use Wine regedit to access Windows registry paths). Games with Steam Cloud support may store data in ~/.steam/steam/userdata/<user-id>/7520/ in addition to or instead of this directory. The app ID (7520) may differ in some cases. Treat backslashes as forward slashes. See the glossary page for details.